Entrepreneur. It’s kind of a dumb word if you think about it, and to most people (especially students) it carries some buzzwords with it that seem very business-y. When I first heard “entrepreneur," I thought to myself, “That’s for people in the college of business.” It never really struck me as, “I’m an entrepreneur,” even though looking back on my life, I’ve been an entrepreneur since I was a kid. Everything from trading Pokémon cards, making beaded bracelets and necklaces, and burning CDs for friends before we learned we probably shouldn’t were all entrepreneurial endeavors that were abundant in my youth (as they probably were in yours). That’s the thing, though. Being an entrepreneur isn’t about putting on a suit jacket or making apps. It’s about making a living doing something you love, while making sure other people love it too (that’s what we call customer validation). And this is one of the things I learned going through Startup Weekend. Click through to read more about the upcoming Startup Weekend taking place in Denton, TX. 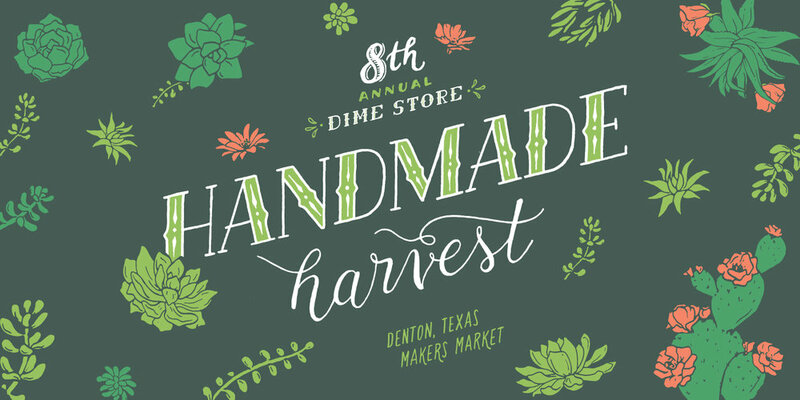 This Saturday is the eighth annual Handmade Harvest event put on by the fine folks at The DIME Store. This annual event is probably the single best day of shopping available in Denton. Yes, even better than that day after Thanksgiving when everyone eats leftover pie and then goes to Target to fight over discounted televisions. At the Handmade Harvest, makers from all over gather together under one roof (this year at TWU's Hubbard Hall) to sell their wares. Read on to find out why you should make sure to stop by this weekend and what to check out. Labor Day weekend was a dark news cycle that included Hurricane Harvey footage and terrible rumors Denton's legendary LGBTQ+ haven Mable Peabody's Beauty Parlor & Chainsaw Repair was suddenly closing. Sunday was the secret finale for this Grand Dame of Denton hangouts, whose quiet passing can only be fully understood if we survey this venue's storied history from back in the day. That’s what Jacki Wilson, co-founder and Chief Marketing Officer of Upventur had to say about the company’s relocation from Frisco to Denton. Wilson says that Denton has been welcoming and that she appreciates the great energy and vibe that Denton offers. The tech company relocated from Frisco to Stoke, the city owned co-working space in downtown Denton, earlier this year. Read on to find out how things have been going for them since launching their platform last month! Who knew, a beautiful, stunning and (almost) 360 degree view of our beloved town has been collecting cobwebs on the 8th top floor of the historical Wells Fargo building on the corner of Hickory St and Locust? As of the last month, the top floor has been contracted to be transformed into a restaurant dubbed Sunago Bell which should open by next summer. You may soon find yourself dining on Mediterranean-influenced cuisine and admiring Denton’s landmarks such as the courthouse and TWU towers, from on high. Read on for more details on this brand new spot! Local Buzz is our new quick and easy guide to the many different breweries and distilleries both in and around Denton County. Let’s be honest: When it comes to breweries, we’re a little spoiled. Sure, we may not yet have the name recognition that a lot of those Dallas gastropubs have, but the beer scene in Denton continues to flow with cool creativity thanks to a crop of longtime dedicated Denton denizens. This spring saw the arrival of two new breweries, which means it’s past time to round up all of the local spots where you can wet your whistle and sample some of the finest brew creations in and around Denton. The U.S. may be behind in the eco-friendly lifestyle compared to other European countries, but we just took one more step in a positive direction. This September, one of the first American companies to make Danish-style Cargo Bikes, Urban Tribe Cargo Bicycles, will ship out their first round of bikes from our very own city of Denton. The group, founded by Dentonite Aaron Powell, already have their wheels in motion. Read on for more info and to find out how you can get your own Urban Tribe Cargo Bike with a steep discount!